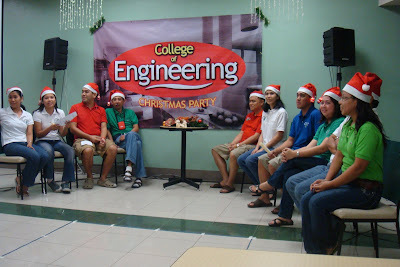 The Civil Engineering Department faculty and staff hosted the Annual Christmas Party of the DLSU College Engineering at the La Casita Canteen, Andrew Hall last Dec. 17, 2009. The theme of the party is "House Party." So the department mimic the popular Pinoy Big Brother set-up with Dr. Danny Terante and Dr. Egay Dona acting as emcee and Dr. Bernard Lejano as Big Borther Ber. Messages were delivered by CE Dept Chair, Ronnie Gallardo and COE Dean, Indette Gaspillo. 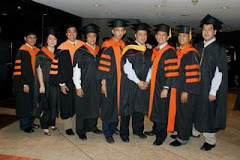 Gracing the affair was former COE Dean, Dr. Angel Lazaro III and visiting lecturer, Dr. Stanley Santos. Games like Sumo Balloon Challenge, Text Twister and Guess the Movie were played. Surprise numbers like the "Nobody But You" dance number by Lawrence, Che, Yen, Lynn and Dr. Alex Fillone brought fun to every body. Raffle prizes and gifts were distributed. The "Loteng" prize was won by Oscar Unas of the MEM Department. Presents were also given to the best house party dressed faculty and staff members. Dr. Danilo C. Terante, Associate Professor of the CE Department was awarded a plaque and medal of distinction by the Philippine Institute of Civil Engineers (PICE) last November 26, 2009 at Camp John Hay Trade and Cultural Center, Baguio City as PICE Fellow for his invaluable contribution to the advancement of civil engineering specifically in the area of hyrdaulics and water resources (HWR) and for the many years of devoted and fruitful service to the institute as director and HWR specialty chair. Dr. Terante was also elected as director and PRO of the PICE-National 2010 Board of Officers. In the recent PICE 35th National Convention with the theme " PICE: Leading the way to green buildings and infrastructure" held at Baguio City on November 26-29, 2009, DLSU-Manila CE faculty, alumni and students particpated actively in the various activities. Dr. Terante (chair), Dr. Jonathan Dungca and Dr. Alexis Fillone served as judges in the PICE National CE Student's Quiz. PICE also conferred the titles of Specialist in Geotechnical Engineering to Dr. Dungca and Specialist in Structural Engineering to Engr. Mary Ann Adajar. The undergraduate students led by Civil Engineering Society (CES) EVP Cheska del Castillo participated in the PICE National Students Conference. 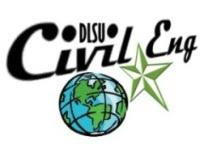 Joenel Galupino was declared the winner in the "Discover Civil Engineering @YouTube", a photo-video competition hosted by the PICE-Lungsod ng Maynila Chapter. He will receive the plaque and cash prize of P5,000.00 on Dec. 4, 2009 during the PICE-LNM Christmas Party. His entry is entitled "KHRPN" or "Kahirapan." It's message is summarized as follows: Poverty can be history if everybody helps in even a small way to alleviate it. There are many ways of eradicating or reducing poverty. 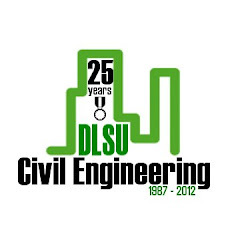 Civil engineers, in particular, can contribute in building a better future of our society through the three of their major tasks: Design, Construct and Maintain. Watch the video below which is posted also at http://discover-ce.blogspot.com and YouTube.